Tint is designed to reduce up to 61% of the total solar energy, making your car cooler and reducing the need for air conditioning. It also protects your interior by rejecting up to 99% of ultraviolet rays. This helps in shielding against discoloring and fading of leather, vinyl and fabric while also offering you protection from the Sun’s UV-A and UV-B Ultraviolet rays which cause wrinkles and skin cancer. According to the American Academy of Dermatology, there is a direct link between more time spent driving and a higher rate of left-sided skin cancer. Tint also helps to cut glare, reducing intensely bright spots on a sunny day and blinding headlights at night. We now also offer windshield tinting that meets the new Hawaii State law. This film is practically clear but blocks more than 99% of UV rays and rejects up to 30-44% of total solar energy. Paint Protection film is the most advanced development in automotive paint finish protection. It is a nearly undetectable film that is applied to help protect against damage caused by rocks, salt, insects and other road debris. 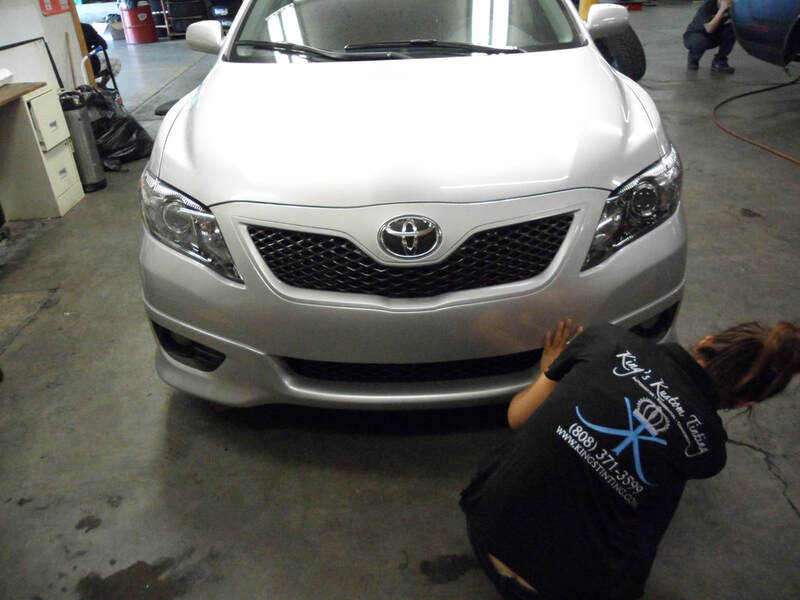 It is applied to the most vulnerable areas of your car such as your hood, fenders, mirrors, grilles & bumpers. It is cut by computer according to your vehicle's make and model to offer the best fit. It also offers a self-healing top coat that is scratch and crack resistant. It offers outstanding optical clarity and is backed by a 10 year warranty but can always be removed and requires no special maintenance.